WESLACO, Texas — The Trump administration scored a temporary win in the courts after successfully appealing an earlier ruling that paused what’s commonly known as “remain in Mexico” policy. The 9th Circuit Court of Appeals temporarily blocked last week’s ruling by California Judge Richard Seeborg. This means that the Trump administration can continue returning asylum seekers to Mexico for them to wait for their court hearings. 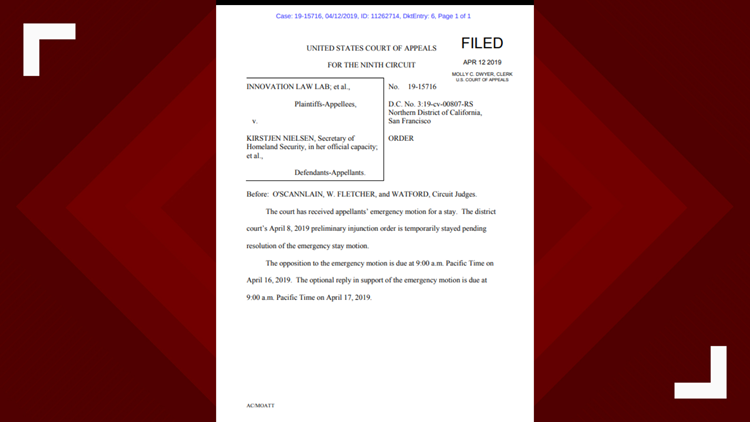 The decision by the 9th Circuit came just before the lower court injunction was to take effect Friday. The experimental policy, meant to stem the flow of undocumented migrants, was gradually introduced in California in late January and later implemented in El Paso, Texas with plans to expand to other areas. In its appeal, the U.S. Department of Justice argued MPP was “designed to address the dramatically escalating burdens of unauthorized migration,” and criticized the lower court injunction arguing it would cause harm to the U.S.
9th Circuit Court of Appeals grants the Justice Department emergency motion for a stay in lawsuit over "remain in Mexico" immigration policy. President Donald Trump praised the ruling on Twitter Friday. The U.S. has returned more than 1,300 migrants to await their asylum hearings in Mexico, according to the country’s National Migration Institute. The appeals court will hear more arguments this week before deciding whether to keep the ruling in place for the duration of the lawsuit.